and from work and probably staved off countless episodes of road rage. Our family has shared mystery, fantasy, and adventure while stretching our vocabularies and our imagination. Opportunities to read aloud have diminished of late, and I miss it. That may be why I jumped at the chance to read an excerpt at the Random House booth at San Diego Comic-Con 2014. I was delighted to see their sound booth, dark and inviting. When I discovered that they were offering free recordings of “Ready, Player One,” a book we are currently reading at home, I jumped in line, chose my excerpt, and started attuning myself to the cadences of the passage. When I stepped inside the sound booth, the near silence after the non-stop sensory overload of the exhibit floor felt like the retinal afterburn from looking directly at the sun. Okay, it was still noisy according to the recording, but believe me, the comparative quiet was balm to my eardrums. For a few moments, I was ruler of my own private cave, cool and isolated from the hub-bub swirling around me. I imagined that I felt much like Wade, the protagonist of the novel, must have felt inside his precarious hideaway. Oops, spoiler alert. 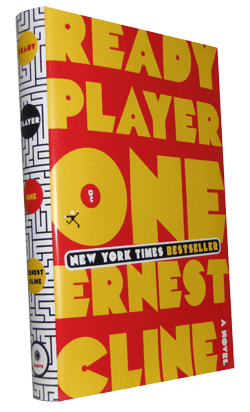 “Ready Player One” tells the tale of a dystopian future overlaid with a glorious romp through pop culture of the 80s and the early days of computer gaming. In the book, an orphan raised in virtual reality struggles to survive online and off. The excerpt below is about a third of the way through the novel. This was the perfect selection to read at Comic-Con. So without further ado, here is my audio reading. Click to play. Thank you, Random House and Random House Audio Books, for providing the booth and for your engineers’ time and expertise cleaning up the recording. Visit Random House Audio Books for professional readings and for free and purchased audio books. I wanna do! I wanna do! 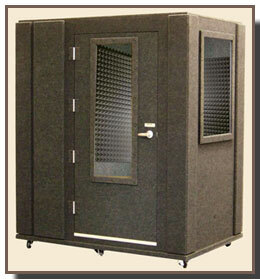 I may simply have to buy one of those sound booths. Do you think I could write it off my taxes? Wait…first I have to make some money first. Seriously, I would love to make audio books. I don’t think I have the kind of compelling voice required, but maybe I could work on that. Well done; I expected nothing less.